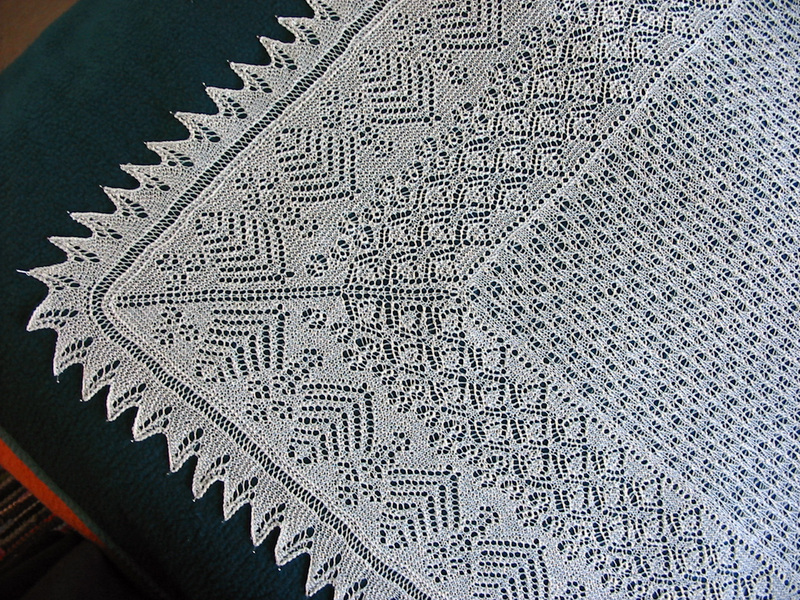 The lace shawl consists of a center square knitted back and forth, a wide border and an edging attached sideways. Instead of the traditional back-and-forth construction for the borders of Shetland shawls I took advantage of the wonderful invention of circular knitting needles. This makes for a nearly seamless construction. Das Tuch besteht aus einem Mittelquadrat, gefolgt von einer in der Runde gestrickten breiten Spitzenborte und wird durch eine seitlich angestrickte Spitzenbordüre abgeschlossen. Bei traditionellen Shetland-Tüchern wurde die breite Borte Seite für Seite in Hin und Rückreihen gestrickt. Aber wir haben ja Rundstricknadeln, da geht das auch einfach in der Runde. Die Anleitung ist nur in Englisch verfügbar, die Strickschriften und Zeichnungen sollten jedoch für jede halbwegs erfahrene StrickerIn fast selbsterklärend sein. Wenn nicht, einfach fragen. 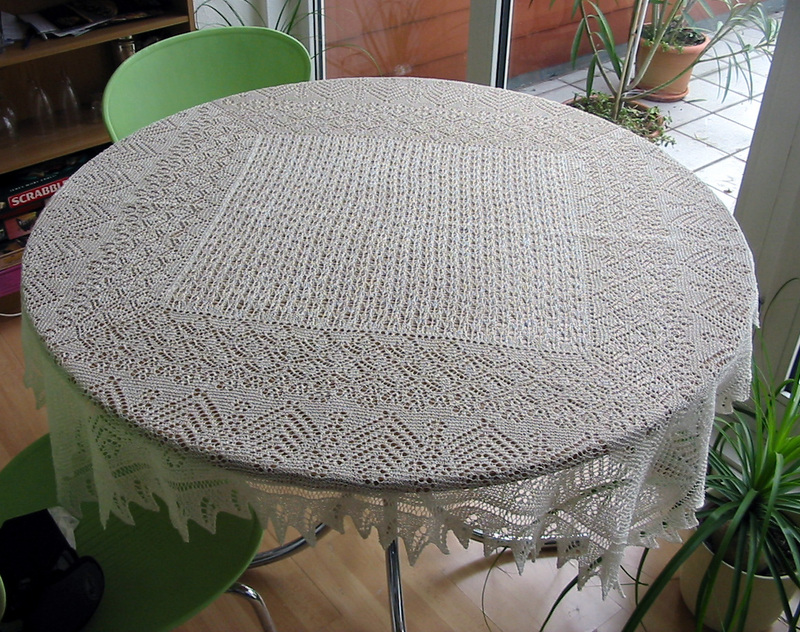 My version is knitted in this wonderful swedish linen thread (originally intended for weaving, I suppose). It makes for an excellent tablecloth. Choose a fine or even a slightly heavier wool yarn and you will end up with a beautiful shawl. Gauge is not of the essence as is often the case with lace projects. Just make sure your chosen yarn and needles result in a nice fabric – not too dense and not to open to show off the stitch patterns nicely.